Reserve Now for a May Getaway! Pickup starting May 1 and returning no later than May 20, 2014 and get $50 off each rental night! 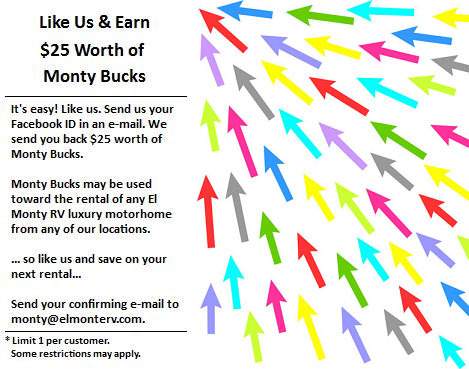 This offer is good at all El Monte RV pickup locations for the CS30 and AS32 model motorhomes only. A three night minimum rental is required. This offer CAN be combined with the 50 free miles per day promotion. Cannot be combined with any other discounts or offers and is based on availability. Restrictions apply and this offer may be discontinued at any time. Call our Call Center at 888-337-2212, or book online, so don't delay! This offer expires March 31st! The Subway Fresh Fit 500 race at the Phoenix Int'l Raceway on March 2nd! The Sprint Cup race at the Las Vegas Motor Speedway on March 7 - 9! The Food City 500 race at the Bristol Motor Speedway on March 14 - 16! The Auto Club 400 race at the Auto Club Speedway on March 21 - 23! The STP 500 race at the Martinsville Speedway on March 30! 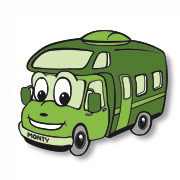 El Monte RV is pleased to feature Leavenworth RV Campground in Leavenworth, WA as this month's Campground of the Month! 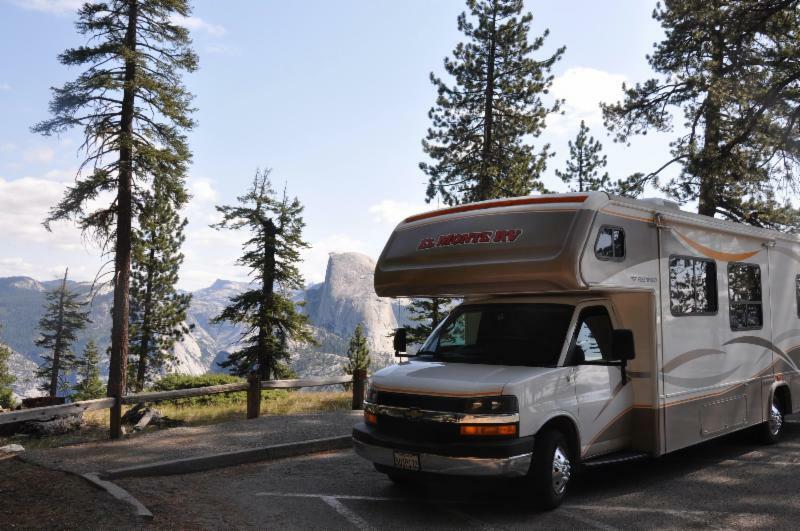 The beautiful Cascade Mountains provide the perfect backdrop to relax or enjoy numerous recreational activities in the alpine setting of the Thousand Trails Leavenworth RV Camping Preserve. At this special RV camp in Washington, they have 300 acres of beautiful forests and meadows. During the winter months you'll be able to ride your snowmobile directly across the street to over 200 miles of groomed snowmobile trails. You can cross country ski, snowshoe, and sled down hills that are all located right there at the Leavenworth RV camp in central Washington. Resort amenities include tennis courts, horseshoes, volleyball, shuffleboard, swimming pool, basketball court, fishing, laundry facilities, a store, mini-golf, free wi-fi and more! If you're a student of Paleontology or just fascinated by fossils, then this is the National Monument for you. Here you'll find fossils of rhinos, horses, and many other species. 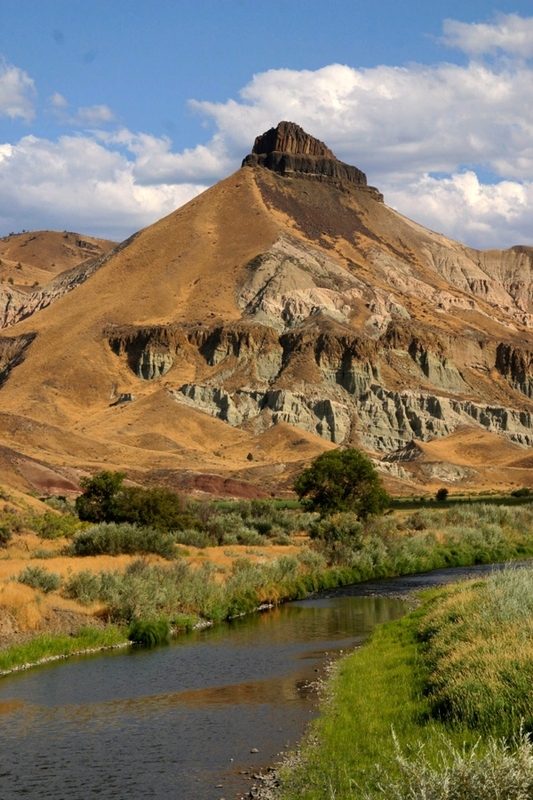 You'll especially want to visit the Thomas Condon Paleontology Center. This is the best place to see fossils from all over the monument. Hiking and star gazing are another of the park's offerings. While there are no campgrounds inside the monument, there are campgrounds in the vicinity. 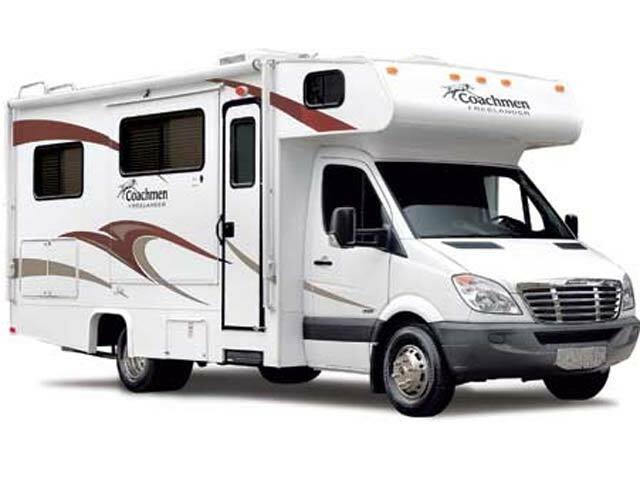 Click the NPS website's Campgrounds page for more information. We have an RV rental location in Seattle, WA that makes the drive to this national monument easy. 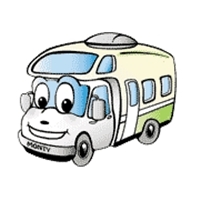 However, if starting your trip from another location is more convenient, we also have many other rental offices, so please visit our locations map to find a location that may be more suitable. ~ Remove plastic coating from chorizo sausage (beef or pork, available in deli section of most markets - half the packet with 6 eggs will serve 3 to 4 adults). ~ Cook over medium heat and when done, add 6 eggs and mix into sausage, making sure you evenly coat the chorizo with the eggs. ~ Heat flour or corn tortillas and fold chorizo and egg into tortilla of choice. Note: One full packet can be prepared with 8 to 12 eggs and will serve 6 to 8 adults.